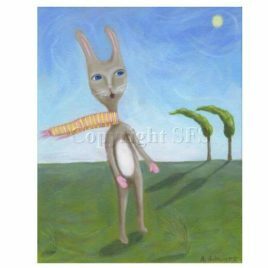 A print of a rabbit wearing a scarf. The image size is 8 x 10 inches, the paper size is 8.5 x 11 inches which leaves a white border for easier framing. Please scroll down for complete details. 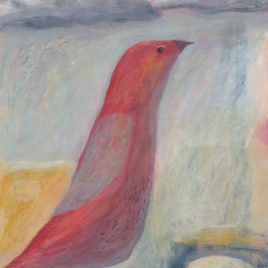 A print of a red bird from an expressionistic painting. It measures 8 x 10 inches. Please scroll down for more details. 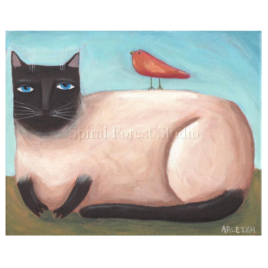 This is an art print of a Siamese cat. The image measures 8 x 10 inches and is printed on great quality photo paper that measures 8.5 x 11 inches. Please scroll down for a complete description. 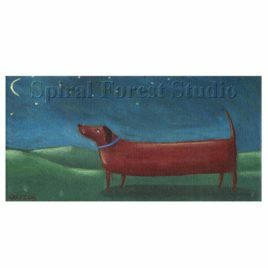 An art print of a Dachshund dog. Please scroll down for full details including size. 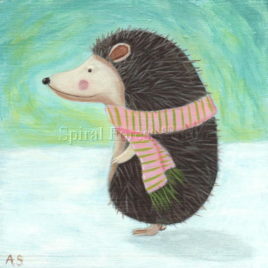 This item is a print of my original painting titled “Winter Hedgehog”. 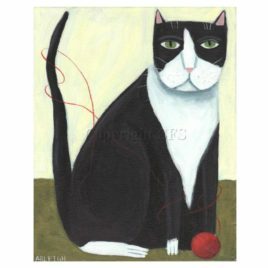 It measures 7 x 7 inches and is printed on a high quality, satin photo paper with archival inks. There is a white border around the image for easy framing. The image is very clear and picks up all of the details of the original painting. The print comes signed, titled and dated on the back of the paper. Please note that the copyright image does not appear on the actual print.